Away from the worldly stressful life – walking barefoot on the pristine sandy beaches and hearing the sounds of the waves, can incomparably rejuvenate your entire existence. The Zanzibar and the surrounding islands have tales beyond that. These extraordinary and beautiful carnations of nature are bestowed with powdery white sandy beaches, turquoise warm water that meets the ocean and the palm tree linings, that makes it a perfect cinematographic like location. You can easily get to the Zanzibar, both via Airways and Waterways. The Zanzibar (or the Unguja) is actually an archipelago that consists of more than fifty islands. For those who are looking for a private getaway, the surrounding Mafia Island, the Fanjove and the Pemba, stand out to be a perfect escapement for all lovebirds. Some of the best beaches of the Zanzibar lay on its eastern sides. The Nungwe beach is one of the most loved and is located on the North West tip of the Zanzibar. The tides are quite appropriate for the swimmers here; however, the area is the most populated one. Next, is the Pongwe beach, which is often the type of beach that photographers are looking for shoots! The Kendwa beach lies very close to the Nungwe and possesses a line of excellent seafood and boutique and buffet restaurants. On the other hand, the Paje beach is much known for its water sports and cultural activities. However, if you are looking for a quiet escape and yet don’t want to go too far from the main island, then the Matemwe beach, with a handful of cafes and guest houses amidst the cool and serene sea breeze, shall be the right choice for you. Best sites for snorkelling and diving are the Nungwi and the Pemba Island. While planning a Zanzibar holiday, you cannot miss out on experiences like: sailing on a Dhow (the traditional Zanzibar style of sailing), watching the exotic birds and red colobus monkeys in the Jozani forest, observing the great display of butterflies at the Zanzibar Butterfly Centre, having a feast of the Mishkaki skewers and bumping into the historic Kidichi Persian Baths. The Pemba Island is just 20 to 30 minutes away from the main Zanzibar Island on the boat and is one of the favourite picks of the visitors. The island is particularly famous for its magnificent reserves of slow walking giant tortoises and the deepest hidden secrets of the diseased prisoners – from where it derives its name from. Besides the natural beauty, the Zanzibar group of archipelago is also well known for its cultural richness. Located at the heart of Zanzibar, is the Stone Town which is the lifeline of the Zanzibar people. It possesses various historic sites, buildings, cultural galore, delectable restaurants and vibrant markets. Must visit sites include: Forodhani Gardens, Palace Museum, House of Wonders and the Old Fort. A Zanzibar Holiday is quintessentially incomplete without a dramatic spice tour. Spices of Zanzibar have always been a topmost attraction and a spice tour of the spice industry is an enthusiastic deal to watch out the deep traditions of the exotic taste of Zanzibar. Added to that are the pristine beaches that really refreshes your mind and set you on fire with new ray of energy. 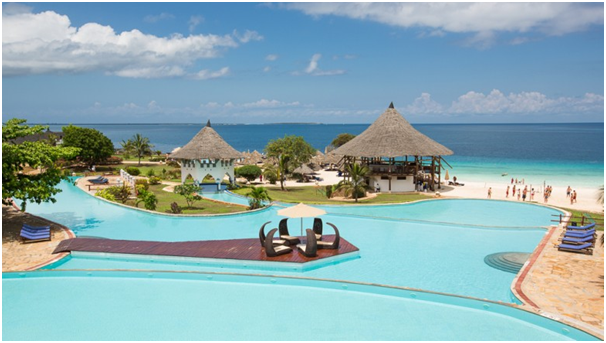 Experience these safaris at affordable price at Zanzibar.